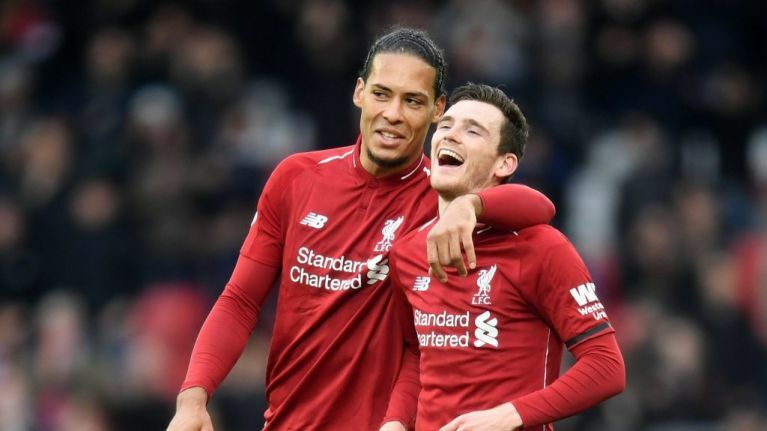 Jurgen Klopp has said he hopes Liverpool can 'close the slipping book' after Andy Robertson was unpunished after mis-controlling the ball and slipping on Sunday afternoon against Chelsea. For context, in case you've been living under a rock for the past five years, the last time Liverpool played Chelsea at Anfield while chasing a Premier League title, Steven Gerrard's slip gifted the ball to Demba Ba, who slotted the ball past Simon Mignolet. Chelsea won. Liverpool blew the title. You remember. Anyway, moving on. There was a lot of tension at Anfield today, as Reds fans feared the narrative Gods would punish them with a repeat of that infamous episode. And there was a repeat, kind of, as Andy Robertson slipped when controlling the ball. Luckily for Liverpool, the ball fell to Gonzalo Higuaín, meaning anyone, including your grandmother, could have caught him up before he got through on goal. Liverpool were also 2-0 up. If anything, it was funny, even to Liverpool fans, that it happened again. Andy Robertson is nailed on to be a Liverpool legend. Speaking about that moment, Liverpool boss Jurgen Klopp suggested he hoped this moment would bring a close to a chapter. "We can finally close the slipping book - Robbo's slip and nothing happened," Klopp said. Liverpool fans will be thinking exactly the same, having got through Sunday's Chelsea match unscathed, and regained their lead at the top of the table.